This is the official support page of “Ustream Status”, a WordPress widget plugin. “Ustream Status” is a widget and shortcode plug-in for self-hosted WordPress site to display the live/offline status of a Ustream channel, using the images. Enter a Ustream channel name, and it will fetch the online/offline status. Then it will display the online/offline status image of your choice. 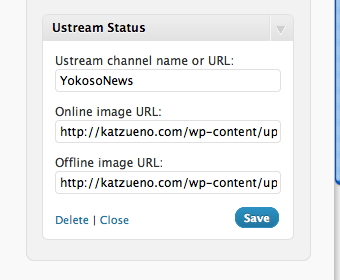 If you have Ustream Status on your WordPress site, the site visitor can see it when Ustream is live. 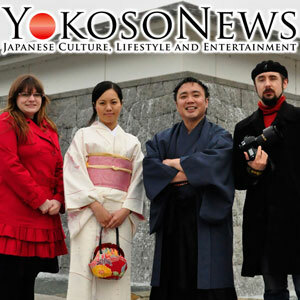 One addition to attract more viewers to the live cast. This website is, of course, using the widget, you can see them on the sidebar. This plug-in is based on my add-on for concrete5 CMS. Also check out the similar plug-in for Twitcasting. .Ustream is one of the major live casting service providers that anybody can start a live cast for free or even make money. 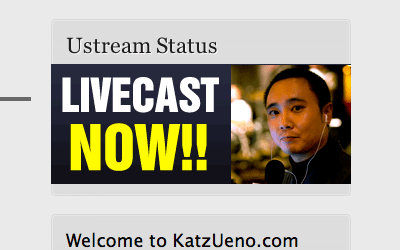 I. Katz Ueno, is not affiliated with Ustream. You need to ask Ustream directly for the question about the service itself. You don’t have to host the images on WordPress server. You just need to store the images on the Internet and the URLs to them. Ustream API only allows you to make certain calls per min per IP address to access Ustream server. Therefore, this plug-in only fetch the online/offline data from Ustream Server once every minute. You may have to wait for 60 seconds until you see the changes. Please be patient! I would like to see how many of you have the demand. Depends on your feedback and your help for this plugins, I will prioritize the new functions. If you constantly add and delete channels, or when you want to uninstall this plug-in, you may want to consider using one of the following plug-in since this plug-in uses transient as part of cache. Please help and send us pull request! Switch to support new Ustream API. You don’t notice the difference but completely changed the way the plugin fetch the online status. Ustream API closed http, so changed it to https. Fixed the shortcode bug that embed code was not output properly. Please give us your feedback, and support open source community. Check out Twitcasting Status plugin, and the sister add-ons for concrete5.